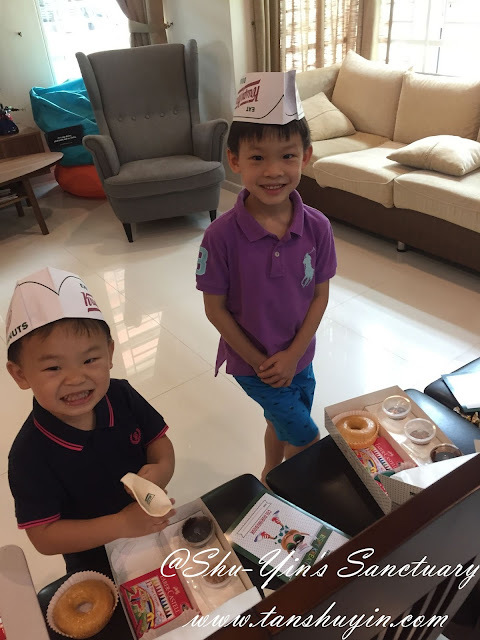 Shu-Yin's Sanctuary: Krispy Kreme Creations - Your Doughnut, Your Way! 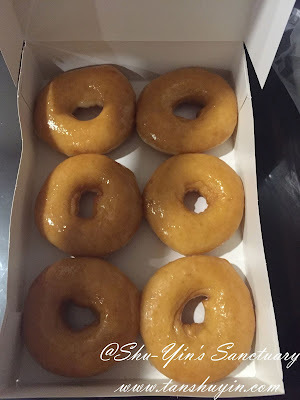 Krispy Kreme Creations - Your Doughnut, Your Way! 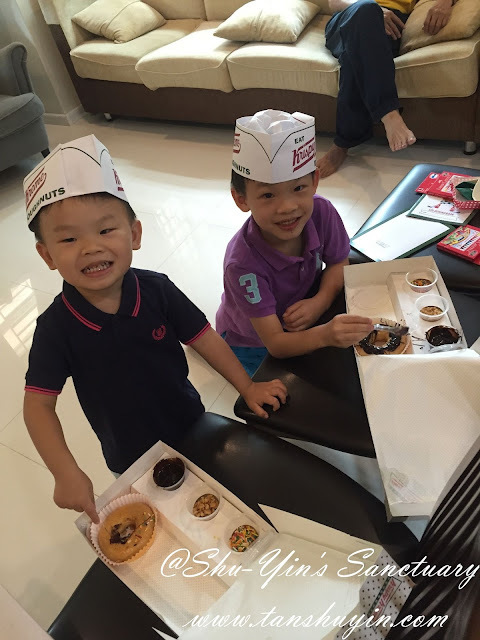 A good friend lugged back boxes of Krispy Kreme doughnuts for family and friends all the way from KL. 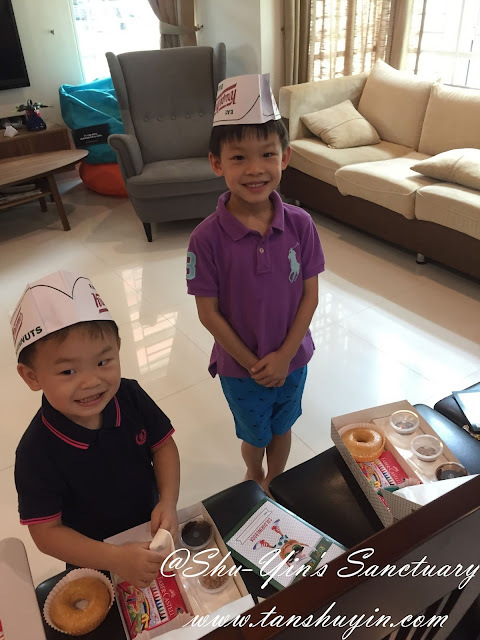 Besides the big box of doughnuts for me, he also gave my boys a box each of Krispy Kreme Creations, which was newly launched in KL just a day before! 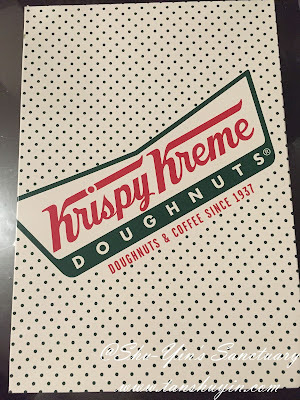 This is my big box of Krispy Kreme doughnuts, only in original sugar glaze flavour as requested. 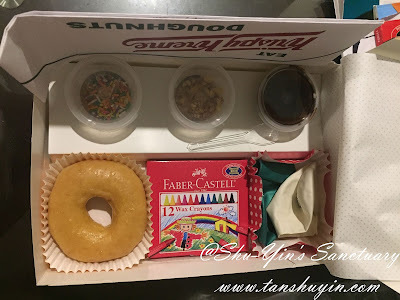 Here comes the fun box - The Krispy Kreme Creations - for kids! On the left is the box cover, with an additional colourful card on top. 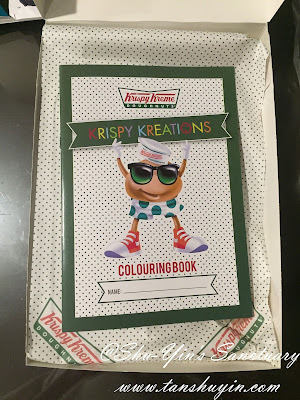 Flip it open and you get a 'KRISPY KREATIONS Colouring Book'! And beneath the book this is what you see. 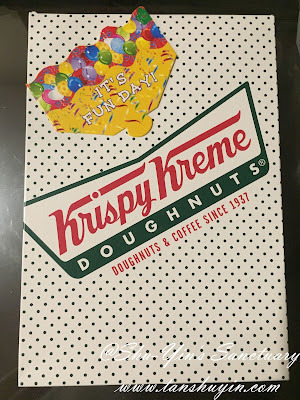 A plain doughnut, a small box of crayons and 2 balloons. The white paper is actually the chef hat! 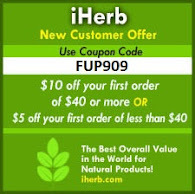 Flip open the chef hat and you will see 3 toppings. Chocolate sauce, crushed nuts and colourful rice sprinkles! 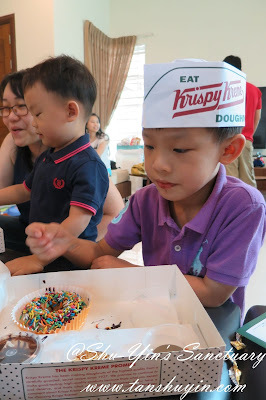 Needless to say, both kids eyes gleamed when they saw that they could decorate their own doughnuts. 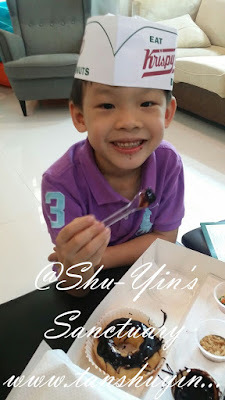 Khye actually didn't know what it was, but just followed his brother! 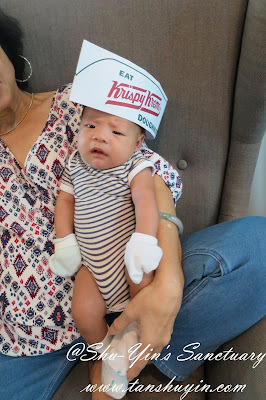 The end results of their doughnuts. 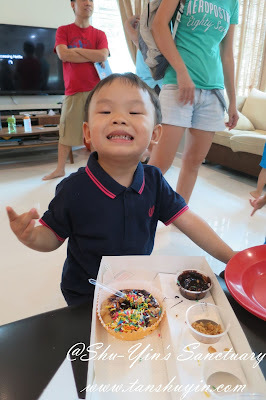 Shern - A nice, even topping of chocolate glaze with colourful rice topping. Even Vern joined in the fun, but I think he was not amused by the chef hat! Shern ate his creation the very next day. 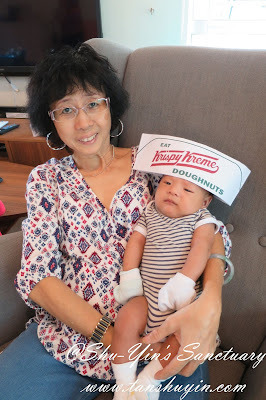 The thing is he couldn't even finished it because it was too sweet I suppose as he was not used to eating such a sweet doughnut. 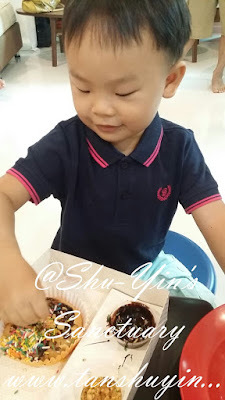 As for Khye, nope, I did not give him his doughnut to eat, and he did not even asked for it. I think he didn't even know it was for eating! hahaha! 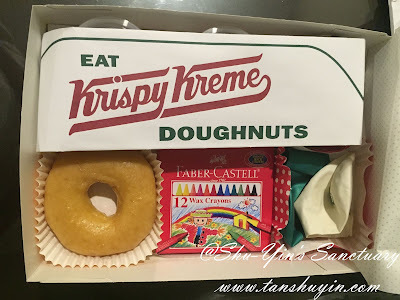 But if you happen to be in KL Krispy Kreme, you can grab this Krispy Kreme Creations for RM16.95, and you can also try the original sugar glaze flavour. That is the only one I like. It is sweet though, so it is only for those with a sweet tooth!